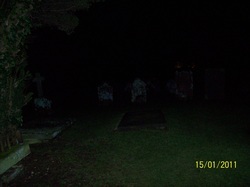 This was our First Investigation, It was kind of a trial run, to see if we could pick anything up. We chose the graveyard because the majority of the people buried there are previous land owners, and there is also a baron that owned the entire estate, the Gravestones we were able to read ranged from the 1800's up to 2005. The present building dates from around 1209, although it has been suggested that there was possibly an earlier wooden 'Saxon' church on the site.